In an effort to share more of myself with my dear readers this year, I’ll start by telling you about one of my struggles. Before I became a full-time writer, I worked as an editor. Wanna know an editor’s sole purpose? To find things that are wrong. To be gripe-y and picky and critical. Not to toot my own horn but . . . I was dang good at it. Especially the being a total grouch part. The problem is that it’s hard to turn it off. Whether I’m on Twitter or watching TV or out for a nice sweet treat with my kids, invariably you’ll, at the very least, hear me sigh. Oftentimes you’ll see me whip out my phone for a pic of some offending something. (“I gotta put this on my blog!”) I’m even given to occasional shouting fits and small bursts of rage. In summary, sometimes it stinks to be TGB or anyone who loves me. Since it’s still January, I think I still have time to make a New Year’s resolution. For 2014, I am going to work on finding the GOOD in things. Y’all are gonna see less fussing from me this year! So why don’t I start right now? Tempting photos of delicious-looking desserts. The clear, oft-stated message of freshness. Sure as heck beats rancidity or staleness. The mystery that is built around WHAT, exactly, the good things come in. 3 has something that holds the good things, but what is it? Do good things come in 3’s purse? In 3’s big wooden box? Maybe I should stop by Marble Slab every few days to try and find out! 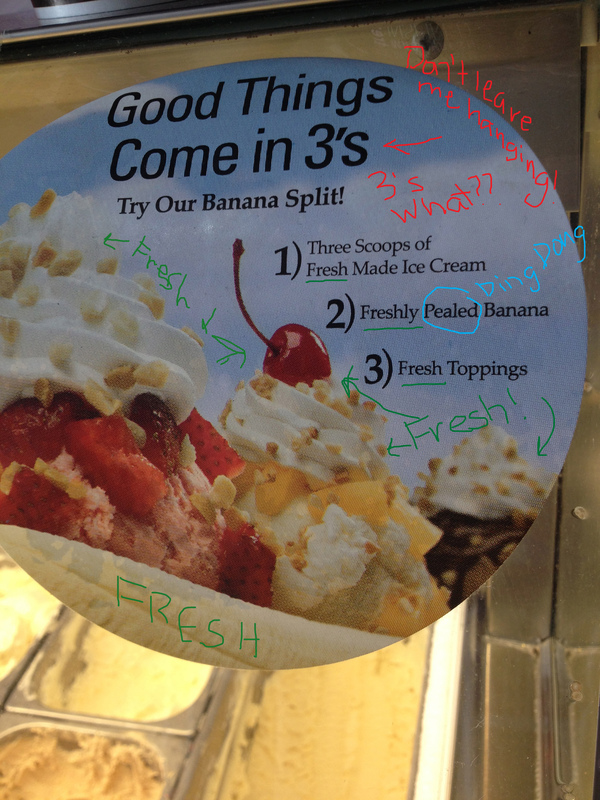 The promise of a shout-out whenever someone orders a banana split, since the banana gets “freshly pealed.” I wonder what they yell. Again, perhaps I should stop by every day or two for further research. How was that? I’m practically the picture of positivity! Your typos and grammatical errors don’t bother me one bit, reality show stars/Facebook users/advertisers/people in charge of the scroll at the bottom of the news! Whom am I kidding? I’ll probably be more successful giving up pie. Or vodka. I love me a pealed banana. This entry was posted on January 30, 2014 by The Grammar Belle in About TGB, Adult Beverages, Don't Make Me Beg, Spelling, When Spellcheck Won't Help and tagged banana split, Marble Slab, Marble Slab Creamery, pealed, peeled, resolutions.